What did I think of the hot air balloon tour? 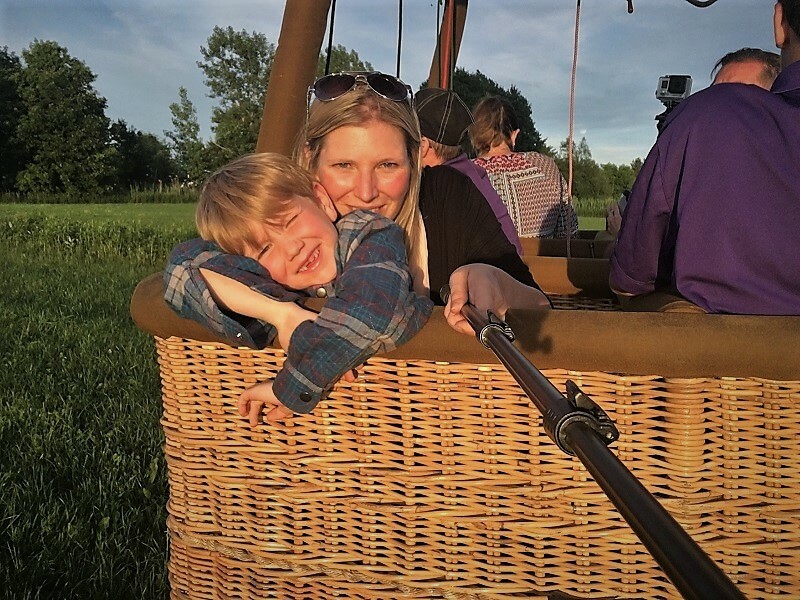 Last week, while on my first trip to Quebec, we did something I’ve always wanted to do – ride in a hot air balloon! I’ll admit, I was quite nervous about being in a hot air balloon. I’m usually pretty good with heights, but the thought of floating 3,200 feet above ground in a basket was a little nerve-racking. However, it’s not every day I have the opportunity to fly in a hot air balloon, so I committed to taking the tour if the weather cooperated. I joined a group of family travel media on an organized FAM trip that was hosted by Quebec Original. It was just me and our oldest son, Braydon, age 6.5 years old at the time. This was also the first time we have traveled together as a pair, so it was extra special to spend quality one-on-one time with him. He’s growing up so fast! Braydon attends French immersion school so this trip to Quebec was the perfect opportunity for him to practice his French. He was very excited and said, “don’t worry Mom, I will order food for us at the restaurant”. Super cute. 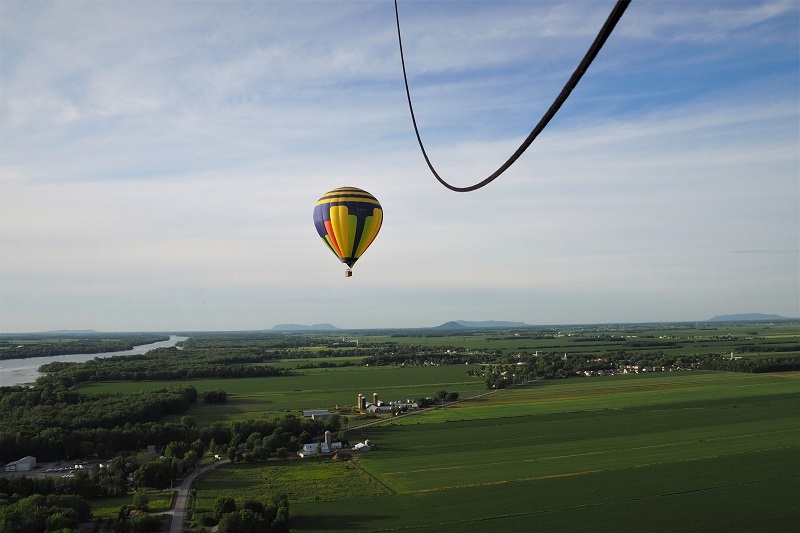 The hot air balloon tour departed from Saint-Jean-sur-Richelieu, which is located in the Montérégie region in the southwest part of Quebec. The thing about riding in a hot air balloon is that the weather and wind both need to be perfect. If the wind is too strong, or blowing in the wrong direction, it’s not going to work. If the weather isn’t right, like rain, there’s a good chance the flight will be cancelled. The day before our ride, we received the good news that our scheduled hot air balloon ride was looking positive. The weather and wind were cooperating, so the ride was confirmed. This is not always the case, so we were happy about our good fortune. When I asked Braydon if he was comfortable going in the hot air balloon he replied, “Yes! We’re going to fly with the birds. I’ve always wanted to do that.” He had no hesitations, even when I explained to him we would be very high up in the air. This boy does not seem to have a fear of heights. La Magie de l’Air, the hot air balloon company we went with, offers two flight times per day – (1) early morning at 6:00 AM to catch the sunrise and/or (2) late afternoon around 6:00 PM for sunset views. We took the late afternoon flight. Travel tip: Given the unpredictability of weather, it’s best to schedule your hot air balloon tour early in your trip, just in case it gets cancelled. This way, you’ll have more chances to try again another day. 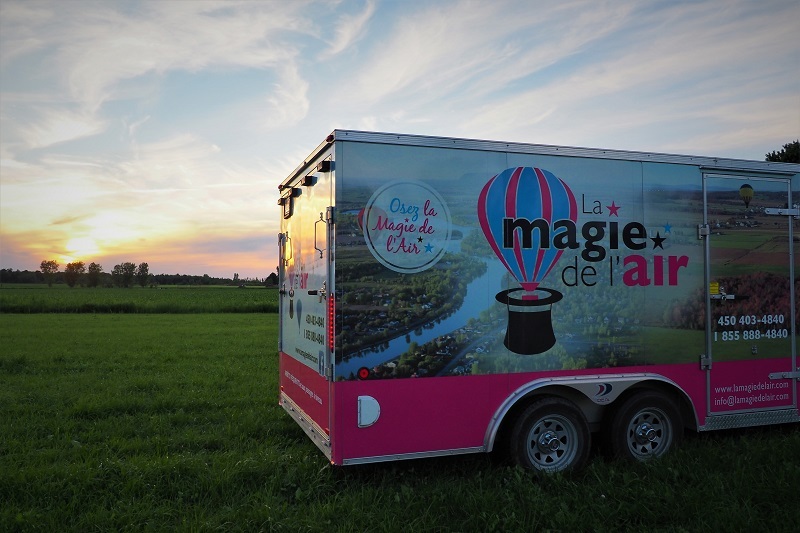 The team from La Magie de l’Air actually came to our accommodations at Domaine Pourki, located on the banks of the Richelieu River, just 35 minutes from Montreal. This is not the norm, but it was a nice touch. It was fun to depart from the grassy field where we were spending the night. Shortly after the team arrived the giant balloons were inflated and fixed to the basket. It’s amazing how quickly they set everything up. It all happened so quickly that I didn’t have time to properly set up my GoPro camera for takeoff. The lift off was smooth and fast. If I didn’t have my eyes open when we lifted off, I wouldn’t have known we had left the ground. During the flight, the basket floated up and down. We slowly glided with the wind and watched the peaceful countryside pass below. It was a surreal experience. The wind was calm but I could still feel it brush against my face. As the basket climbed higher and higher, the butterflies danced in my stomach. Every time I leaned over the edge of the basket to take a photo, I felt my heart skip a beat. It was exhilarating, breathtaking and scary all at the same time. While in the basket you can expect a smooth ride. You won’t feel turbulence like you would in an airplane. It’s eerily quiet when your high in the sky. Except when the pilot blows more hot air in the balloon. That noise is a little loud and initially caught Braydon off guard. At the beginning of the journey he would plug his ears each time the pilot pulled the trigger, but he eventually got used to it. The distance you travel will vary greatly. It’s closely tied to wind speed and direction. 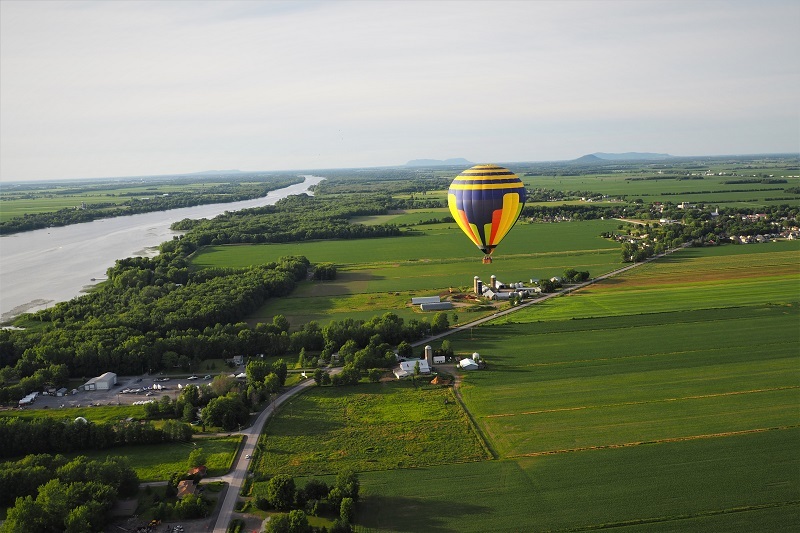 Generally speaking, on a standard balloon ride, you can expect to cover 5 to 15 kilometers. This is why weather is so important and why sometimes a hot air balloon ride may be cancelled. The wind determines the direction. And it needs to be perfect. Every hot air balloon experience is different. The team at La Magie de l’Air suggests you plan for 4 hours from start to finish, including the post flight celebration and the drive back to your original starting point. From take-off to landing, the flight usually lasts between 45 minutes to 75 minutes. Our flight was just shy of 60 minutes. The entire tour was about 3 hours. Before the tour, I didn’t know how high the balloon would actually go. During the ride, I learned that these hot air balloons will fly at different altitudes. The pilot will decide the best altitude for the weather conditions. At our highest point we reached 3,200 feet. There were also times we were so low that we were skimming the treetops. 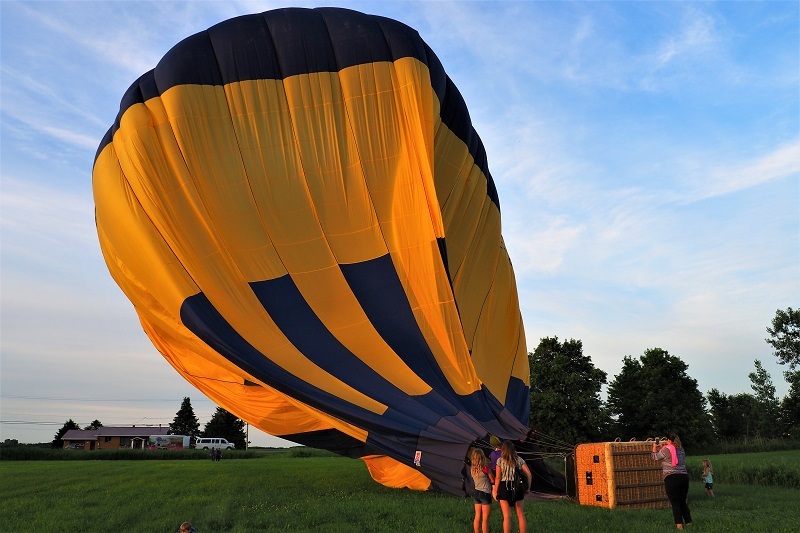 After we landed, our pilot asked us to stay inside the basket while the La Magie de l’Air team deflated the balloon. Once it was safe to get out of the basket, our group was asked to help pack up the balloon and fold it neatly for storage. Do you remember the children’s game where you use a parachute to make a giant balloon and everyone would huddle inside the big bubble? I now understand where this game originated. Trying to get the air out of this gigantic balloon was just like that. Braydon thought it was so much fun. I found this to be the most fascinating part of the hot air balloon experience. The location of where the balloon actually lands will change depending on the wind. Hot air balloons cannot technically be steered, they simply float with the wind. Because of this, each landing location is different. As we were flying, the pilot used an ipad to locate an appropriate field to land on. I learned some fields have pre-clearance for landing, while other fields do not allow the balloon to land without permission. Our pilot and his team spotted a landing spot and called the owner to ask permission to land on their field. The land owner gave the approval. If they had not received approval, we would need to continue flying until we found an alternative landing location. The hot air balloon being deflated after landing. Packing up the balloon. The air needs to be pushed out before it is carefully folded. This was my biggest question/concern when I first learned we would be taking a hot air balloon tour. I worried about Braydon’s safety and whether he’d be tall enough to enjoy the experience. My concerns were put to rest when the team at La Magie de l’Air explained the measures that are put in place to ensure passenger safety. Braydon was not tall enough to look over the side, so instead he sat on the floor and peered out of the holes in the basket (see photo above). He said he could see just fine and that he really enjoyed the flight. La Magie de l’Air recommends kids be at least 5 years and older. Braydon was 6.5 years old at the time. We knew were were in good hands when we met the team at La Magie de l’Air. The pilots have extensive training and experience with hot air balloons and the company has an excellent safety record. I was impressed by their attention to detail and commitment to safety. After we landed, the team approached the land owner who granted them permission to land on their field. The team presented the owner with a bottle of bubbly to thank them. It’s evident that this company cares about people. We arrived back at the original starting point at Domaine Pourki and shared a glass of celebratory champagne. 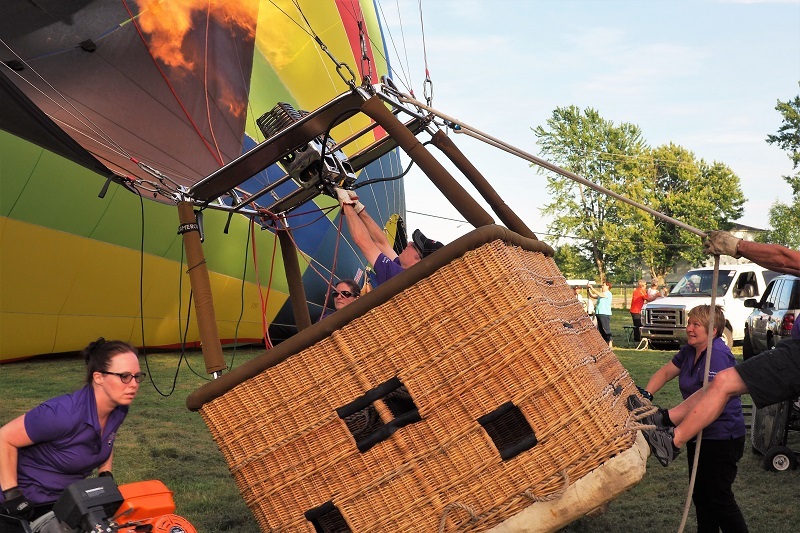 This is a tradition in the hot air balloon industry dating as far back as 1783. Although I was nervous, I’m so glad I went on this hot air balloon tour. In fact, I’m excited to try it again. The experience was unlike anything I’ve done before. It’s so calm and peaceful up in the air and the views are spectacular. You really have to experience it at least once in your life. 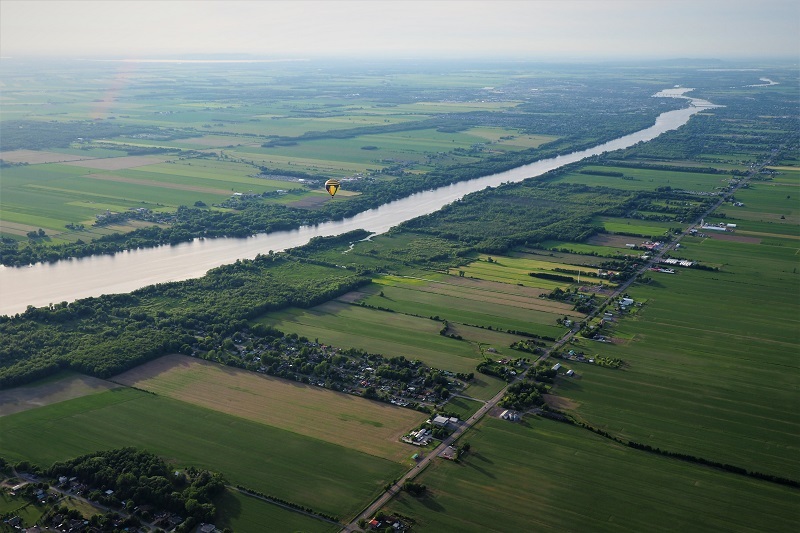 If you find yourself in Quebec, consider visiting Saint-Jean-sur-Richelieu (it’s about an hour drive from Montreal) to experience a Quebec hot air balloon ride. We had a great time and we think you will too. Share your experience in the comments section below. Our readers thank you! Disclosure: we teamed up with Quebec Original in order to make this trip possible. Our hot air balloon ride was complimentary. We agreed to share our honest, firsthand experience on this blog and social media channels. Read our disclaimer here and see our previous campaigns here. Hi there! This is first time I visited your blog and quite inspiring.Thanks for sharing your experiences and cool pictures. I personally never been in a hot air balloon , but it defiantly seems lot of fun. Its in my bucket list now. What a nice experience at Quebec ! Amazing experience in Quebec! Hope you guys enjoy a lot. I have added this hot air balloon trip to my bucket list. Loved your blog. Your son’s comment about flying with the birds made me chuckle! That’s exactly what my daughter said when we climbed into the basket of our hot air balloon on St Maarten a couple of years ago. We set off at sunrise, so we had the most amazing bird’s eye view of the rising sun. It was one of the highlights of my vacation and my daughter was speechless for at least 10 minutes, which has to be a miracle! Haha, I didn’t hear much out of Braydon either 🙂 Sounds like a lovely trip – would love to try at sunrise too sometime.